DNA sequencers. 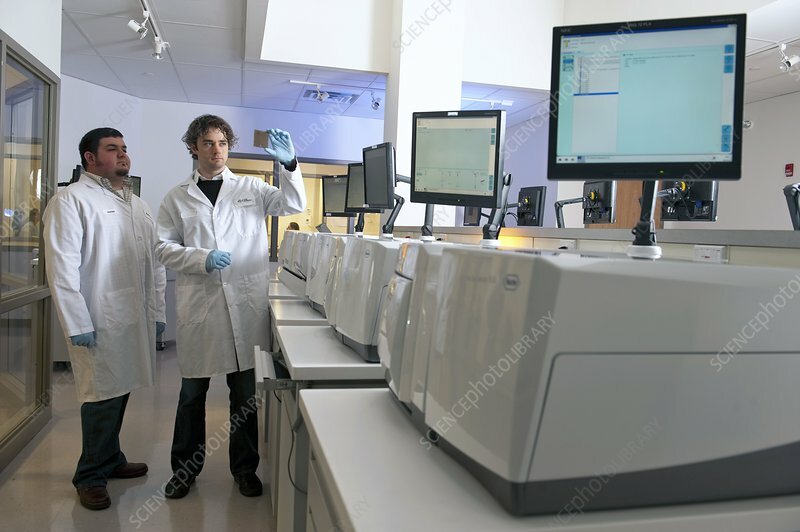 Technicians standing next to a row of GS FLX sequencing machines at 454 Life Sciences, Connecticut, USA. DNA (deoxyribonucleic acid) sequencing determines the exact order of the four chemical bases that make up a gene. These machines, developed in 2008, are capable of processing huge numbers of DNA sequences in parallel at the same time, a process known as 'high-throughput DNA sequencing'. One GS-FLX machine can sequence 400-600 million bases over a 10-hour run. Early sequencers used for the Human Genome Project, which began in 1990, could only process 100,000 bases at extremely high cost. Due to the high performance, accuracy and relatively low cost of these machines, they are used widely to process the entire DNA sequences (genome) of organisms. Photographed in 2009.